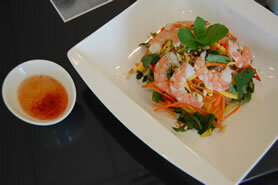 Enjoy authentic Vietnamese cuisine with a modern touch at Authentic Vietnamese Pho House. Our focus is on the freshest ingredients and preparation, resulting in healthy dishes full of flavour. Our customers are loyal and love the cosy atmosphere in our dining room: we attract families, seniors, students and business people from the area throughout the day. Our menu features classic Vietnamese dishes such as pho (rice noodle soup with a beef stock), rice dishes, noodle bowls and spring rolls, as well as new house specials, such as mango salad, quail and rare beef carpaccio. Beverages include tea, fruit shakes, soft drinks and the ever popular Chinese Bubble Tea. Our menu offers something for everyone, including vegetarian, gluten-free and low-sodium diets. Come in to sample our fresh and innovative menu. 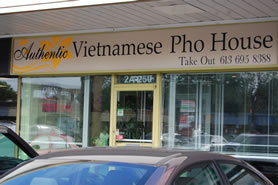 Nestled in between Tim Horton's and Pet Valu at Greenbank Hunt Club Centre is a true gem, Authentic Vietnamese Pho House. Serving gorgeously prepared Vietnamese dishes with the freshest ingredients and a uniquely modern touch, this little restaurant has quickly established a very loyal and growing clientele since opening its doors in early 2011. Peter's mother is a welcome fixture in the kitchen, preparing ingredients throughout the day and assisting with cooking as needed. Peter's two younger brothers are very much on hand to help out, including one who is in his second year of a two-year chef training program at Algonquin College. It's incredibly satisfying for Peter to be able to mentor his brother as he develops as a chef, and to benefit from the fresh ideas he brings to this very innovative kitchen. Peter's wife is the main server and enjoys the interactions with customers. 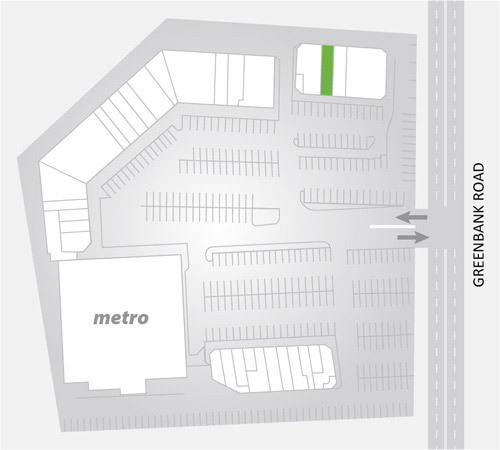 As a Barrhaven resident, finding a space for the restaurant he wanted to create close to home was very appealing. When he viewed the space at Greenbank Hunt Club Centre in 2010 - formerly a beading store - he knew he had found the home he was seeking for his business. Extensive renovations led to the rear half becoming a spacious, professionally outfitted kitchen, and the front half being transformed into a light and airy dining space. House specials include a meticulously prepared mango salad, bursting with colourful peppers, onions and herbs and topped with shrimp and a flavourful dressing. Quail served on a bed of lettuce with lemon pepper sauce and rare beef carpaccio have become very popular signature dishes, and crab meat soup is an unusual dish originating in Hanoi that has found new life in Peter's hands. With the focus being on fresh ingredients, including a wonderful medley of vegetables and herbs, and beautifully simple preparation at the heart of each dish, Peter's menu is not only extremely flavourful but also wonderfully healthy. 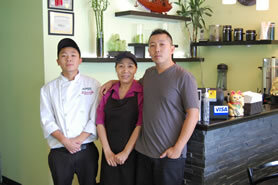 The menu makes healthy eating, including low sodium, vegetarian and gluten-free dining, a snap. 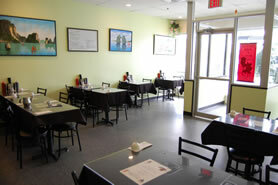 Beverages include tea, fruit shakes, soft drinks and the ever popular Bubble Tea.